Theoretical studies on toluene recovery from air in the TSA (thermal swing adsorption) system with a ﬁxed bed of zeolite adsorbent are presented. The TSA cycle consisted of three steps: adsorption of toluene from air, desorption of toluene with hot nitrogen, and cooling of the adsorbent bed with cold nitrogen. The closed-loop method was used to enhance the efﬁciency of toluene recovery. Dealuminated Y zeolite (DAY-20F) was chosen as adsorbent. A nonisothermal, equilibrium mathematical model was used to simulate concentration data for adsorption, desorption and cooling steps. The aim of research was to study the inﬂuence of gas temperatures in the bed inlet and condenser outlet during desorption on air puriﬁcation efﬁciency. Results of theoretical analysis of isopropanol recovery in the thermal swing adsorption (TSA) system with a ﬁxed bed of polymeric adsorbent are presented. The TSA cycle consisted of three steps: adsorption of organic compound from air, desorption with hot nitrogen, and cooling of the adsorbent bed with cold nitrogen. A nonisothermal, nonequilibrium mathematical model was used to simulate temperature and concentration data for adsorption, desorption and cooling steps. The LDF-type model was used in the description of adsorption kinetics. The aim of analysis was to study an inﬂuence of gas temperatures in the bed inlet and condenser outlet during desorption on the effective activity of adsorbent bed. Dowex Optipore V503 was selected as adsorbent. The paper presents theoretical analysis of air adsorptive drying in the thermal swing adsorption (TSA) system with a layered bed containing silica gel and zeolite 13X. A nonisothermal, nonequilibrium mathematical model was used to simulate concentration data for water adsorption and desorption. Dynamics of water adsorption in the silica gel bed was compared with that in the layered bed with zeolite 13X and silica gel. It was shown that the air drying TSA process proceeded more efﬁciently in the layered bed than in the zeolite 13X or silica gel bed. Research results dealing with atomization of water and aqueous solutions of glycerol in a medical inhaler are presented in the paper. Analysis of inﬂuence of viscosity on the droplet size, droplet size histograms and mean droplet diameter was carried out. It was proved that viscosity affected signiﬁcantly the droplet size diameter. For higher glycerol concentration, the fraction of droplets with a larger diameter increases and the droplet size histogram is wider. Research results dealing with mixing time effect on the droplet diameter in emulsions prepared on basis of canola oil with the addition of non-ionic surfactants SPAN 20 and SPAN 80 are presented in the paper. The emulsions used appeared to be Bingham ﬂuids. The lower values of Sauter diameter were obtained for systems with the addition of SPAN 80. Results of numerical study of hydrodynamics in an agitated vessel with the eccentrically located propeller are presented in the paper. In order to describe complex ﬂow pattern in such type of apparatus the Scale Adaptive Simulation (SAS) with the use of Shear Stress Transport (SST) turbulence model was applied. Detailed hydrodynamics data were obtained as a result of numerical calculations. Based on these data, a ﬂow ﬁeld in the agitated vessel was identiﬁed. The aim of this work was to investigate an inﬂuence of temperature, air ﬂow rate and gas mixture composition on the effectiveness of coil heat exchanger. The studies were performed with air ﬂow rate varying from 3 to 20 dm3/min (laminar ﬂow range). Operating temperatures ranged from -30 to -10 oC. The effectiveness increased with increasing air ﬂow rate and decreasing operating temperature. This effectiveness was higher when gas mixture contained 2-propanol vapours condensing in the coil. The paper presents experimental results concerning air and water ﬂow through open-cell aluminum foam. Analysis of the results allowed one to determine the inﬂuence of foam parameters on pressure loss values in ﬂuid ﬂow through the cellular space of foams. It was found that frictional pressure drop of ﬂuid ﬂowing through aluminum foam could be described by the Forchheimer equation. It was also demonstrated that permeability of foams as well as inertia coefﬁcient are not only dependent on structural parameters of foam but also on ﬂow conditions and ﬂuid properties. Results dealing with crude oil desalination carried out in an innovative installation are presented in the paper. The installation consisted of jet-pump mixer and microﬁlter. A uniform distribution of water in crude oil was obtained after 1-minute mixing of liquids in the jet-pump mixer. The polypropylene microﬁlter was then used for emulsion breaking. The best results of emulsion breaking were achieved when a ﬁlter with the lowest pores was used and emulsion ﬂow rate through the ﬁlter was the smallest. Results dealing with evaporation of water − OMIM[Cl] ionic liquid solutions carried out in a wiped ﬁlm evaporator are presented in the paper. The dependencies between the individual heat transfer coefﬁcient and liquid ﬂow rate, heat load and mixing arm rotational frequency were elaborated. So far, such data are not available in literature, and therefore the results presented by the authors should help in designing of ionic liquid regeneration process. Experimental results dealing with investigations of isopropanol adsorption in a column with the activated carbon bed were analyzed using the wave propagation theory. Sorption isotherms were described by the non-linear Langmuir and Freundlich equations. On basis of experimental and computation results the breakthrough curves were estimated. The inﬂuence of inlet concentration and superﬁcial velocity on breakthrough curves’ shape, volumetric mass transfer coefﬁcient and half breakthrough time was presented and discussed. Results of experimental investigations of liquid aerosols (mist) ﬁltration on monolayer and multilayer ﬁbrous ﬁlters are presented in the paper. Inﬂuence of ﬁlter structure (ﬁber diameter distribution, thickness of layers in multilayer ﬁlters) on the ﬁltration efﬁciency and pressure drop in the ﬁlter was observed. Changes of efﬁciency and pressure drop as a result of long-lasting ﬁlter work are also shown. Finally, conditions at which the ﬁber drainage takes place are given. Results of numerical simulations of droplet motion on smooth and rough ﬁbers, obtained by means of the two-phase lattice Boltzmann method are shown. Two phenomena inﬂuencing droplet velocity: the increase of apparent contact angle on the rough ﬁber surface and the triple line pinning on asperities were observed. The predominant conditions of both of these mechanisms were investigated. The study reports on research results in a ﬁeld of mixing in a novel-design jet mixer. The main objective of this paper is to present residence time distribution measurements for the tested construction. The variation coefﬁcient, CoV, was calculated based on the results obtained. The relationship between this coefﬁcient and hydrodynamic conditions is presented and discussed. The main objective of this paper was to present measurement results of pressure drop in a novel-design jet mixer. Based on the analysis of experimental data, the analytical description in a form of power characteristics is proposed. Efﬁciency of silica gel-water adsorption chillers can be increased by the reduction of thermal resistance between an adsorbent bed and heat exchanger tubes. Measurement results of quantities inﬂuencing the adsorption capacity of silica gel in a granular form and after consolidation with a metal surface were presented. Signiﬁcant deterioration of adsorption capacity resulting from pellets’ consolidation with a metal surface with the use of polyvinyl alcohol solutions was not noticed. Application of the Trefftz method in the determination of two-dimensional temperature ﬁeld of boiling liquid ﬂowing through an asymmetrically heated rectangular minichannel is presented in the paper. The Trefftz functions for a known velocity proﬁle were introduced in the energy balance equation. Calculations were performed for liquid phase only. The results were compared with a simpliﬁed model where the Trefftz method was combined with inverse operations. Both approaches gave similar results. 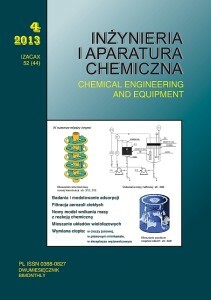 The paper presents dependencies of ﬁltration and performance parameters upon the structure of tested nonwoven cloth systems (especially the thickness and porosity), machining process parameters and aerosol physicochemical parameters (air velocity rate, inlet aerosol concentration, particle size and operational ﬁlter time). Fibers of polypropylene (PP), polyester (PES), polybutyl teraftalate (PBT) and polyphenylene sulﬁ de (PPS) of diameter range from 3 to 50 μm were used in preparation of ﬁltration systems with a gradient-type varying structure. The systems with dispersed liquid phase: aerosol of di-(2-ethylhexyl) ester of sebacic acid and dispersed solid phase: ASHRAE 52.1. synthetic dust were used in testing of dynamic ﬁltration characteristics. Application of smoke ﬂow visualization, thermo-anemometer and tracer gas method (SF6) for testing the chemical fume hood performance at workplaces is presented in the paper. An inﬂuence of air ﬂow ﬂuctuation outside the fume hood on its performance (working chamber airtightness) was investigated. The results confirm possibility of cooperation between a general and local room ventilation system leading to the increase of fume hood airtightness and safety of personnel working with chemicals. Effects of external mass transfer between a drop and its environment on the course of complex chemical reactions are investigated. Three methods of modeling are presented. The first and second one are based on the ﬁlm model and the penetration model, respectively. The third one includes effects of both: surface mobility and ﬂuid deformation that are observed when the drop moves in liquid environment. The results of numerical simulations concerning the concentration distribution of ﬂoating particles in suspension produced in an agitated vessel equipped with the bafﬂ es and pitched blade turbine (PBT 45) are presented. Numerically obtained distributions of particles concentration in liquid are shown in a form of proﬁles and contours. Stagnation regions for particles in the agitated liquid volume were identiﬁed. The purpose of the study was to determine Biochemical Methane Potential (BMP) of energy crops at different levels of nitrogen fertilization. The greatest efﬁciency of biogas production per tons of wet weight was obtained from canary grass 4831.6 m3/ha/year of nitrogen fertilization of 80 kgN /ha, while the lowest one at 160 kgN/ha. The highest yield of biogas 8670 m3/ha/year has been obtained from maize with 80 kgN/ha, while the least equal to 7810 m3/ha/year at 120 kgN/ha. The aim of these experiments was to enhance the citric acid bioproduction in Aspergillus niger submerged cultures supplemented with Tween 80. To maximize the effect of citric acid fermentation, the optimization of culture medium and fermentation conditions was performed using a method proposed by Box and Wilson. The optimization result was the enhancement of citric acid concentration in fermentation broths from 47.01 to 66.37 g/dm3 and the reduction of sucrose in redefined fermentation medium. Results of analysis of baker’s yeast cultivation process in an airlift bioreactor are presented in the paper. The effect of operational conditions on gas holdup and liquid velocity was studied. The analysis of microscopic images enabled a quantitative description of changes taking place within the microorganisms cell population during the process. Additionally, results of ﬂuid ﬂow CFD simulations were presented. The aim of this study was to determine the characteristics of gas bubbles’ size for air – low viscosity Newtonian liquid system in the riser of an external-loop airlift column. Numerical computations were carried out for three different numbers of oriﬁces in the plate, equal to 3, 6 or 12, respectively. Based on presented results, both the character of quantitative and qualitative distributions of dispersed phase and the magnitude of interfacial area were estimated. Inﬂuence of mineral nanoparticles used in the production of polymer nanocomposite on surface properties of the lung surfactant phospholipid (DPPC) monolayer was investigated. Based on the analysis of molecular arrangement derived from monolayer compression isotherms, the discussion dealing with nanoparticles and phospholipid interactions was presented. It was stated that tested nanoparticles modiﬁed original surface properties of DPPC monolayer, changing intermolecular interactions and ﬁlm structure. Inﬂuence of rotating magnetic ﬁeld on the neutralization process (weak acid – strong base) is presented in the paper. The obtained results are worked out in a form of relevant mathematical relationships. As follows from the experimental investigations, the applied magnetic ﬁeld has a strong inﬂuence on obtained stoichiometric points. The main goal of this work was to investigate the effect of stearate sodium sulfate surfactant on the reduction of drying induced stresses in clay-like materials during drying. The experiments were carried out on cylindrical samples molded of kaolin-clay wetted with water solution of different surfactant concentrations. The samples after moisture distribution leveling were subjected to convective drying in hot air at temperature of 90°C in a dryer chamber. The acoustic emission method was used to monitor the stress development in drying samples. Moreover, the samples were observed and photographed to visualize their shrinkage during drying. Analysis of carrot quality after convective drying at constant and variable temperatures (frequencies and amplitudes) of drying air is presented in the paper. Slices of carrot root with initial water content of 88 – 90% were dried convectively at constant temperature of 70°C and variable temperature up to the final moisture content of 9÷12%. The drying kinetics, color change, water activity and retention of β-carotene of carrot were evaluated. It was shown that non-stationary drying carried out at variable air temperature minimized unfavorable effects of convective drying of this biomaterial. A dead zone is a part of catalyst pellet where the chemical reaction usually stops due to vanishing concentration of one of reactants. It can happen when the kinetic equation satisﬁes certain conditions and when the Thiele modulus is greater than its critical value, Φkr . In this paper a formula which allows the fast and simple computation of Φkr for a slab catalyst pellet and for any type of kinetic equation was derived. The correctness of derived formula is confirmed by its compatibility with the results available in literature. The design, operation modes and extension options of an experimental system for testing porous polymer membrane cleaning using supercritical ﬂuids are presented in the paper. The system enables one to carry out batch and continuous cleaning applying supercritical carbon dioxide, organic solvent or mixtures thereof. The system can be extended in order to allow the carbon dioxide recirculation. The experimental results can be used for validation of CFD models. Hydrophobic room-temperature ionic liquids can be applied as solvents in the extractive separation of biobutanol produced via microbial fermentation. While studying the extraction equilibrium, it was discovered that raffinate and extract compositions were dependent not only on process temperature but also acetone, butanol and ethanol concentrations in feed solution. This study offers a mathematical description of mutual solubility of ionic liquids and water in the model five-component systems. A mathematical model of ground heat exchanger cooperating with a heat pomp was presented. The model is based on one-dimensional heat conduction equation with the internal source. On basis of obtained results both a ground temperature distribution as a function of location and time as well as the time courses of inlet and outlet temperatures of working liquid in the heat exchanger are shown. The calculations based on the presented model can be useful for the simulation and design of these devices. Time courses of bed temperatures during the adsorption removal of water from ethanol-water vapor mixture were studied. In each series of measurements the bed of zeolite with a different degree of water saturation was introduced into the column. The obtained courses of temperatures were compared with values received on basis of the process mathematical model. The results confirmed the adequacy of the process model used. The main aim of this work was to describe the homogenization process of granular material in a ribbon mixer. Random process is characterized by means of a new form of entropy criterion estimating the mixture current state. The additional diagram and informational index were developed to describe variations of informational entropy during the process. The proposed informational description is a good and informative characteristic of stochastic system state. A model of heat transfer which takes into account the temperature equalization between heat storage tank zones is presented. Heat transfer was described using an equation of transient heat conduction in an infinite plate with the internal heat source. On basis of numerical method, the water temperature proﬁle as a function of time and the tank height was determined. The results were compared with the research data obtained in the experimental setup. Research results dealing with the destructive oxidation of toluene admixture in air using a corona and hybrid corona – catalytic reactors are presented. A generator and reactors of authors’ own design and catalyst (4 g) of composition 45 wt. % MnO2 , 30 wt. % Fe2O3 and 25 wt. % CuO obtained in authors’ own laboratory were used. The measurements were performed for different parameters of generator operation. A generator voltage varied in a range from 13.2 to 13.6 kV, whereas current frequency in a range of 0.4÷1.8 kHz. The toluene concentration was changed in a range 0.78÷7.20 g/m3 and gas ﬂow rate within a range 520÷1475 Ndm3/h. 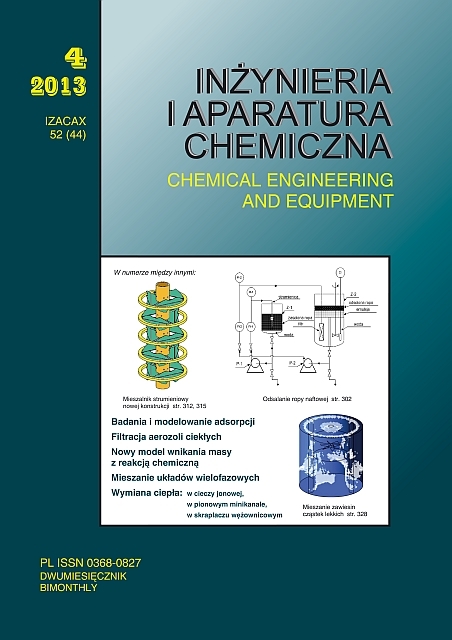 It was established that depending on generator parameters, volume gas ﬂow rate and gas temperature, the destruction degree of toluene to non-toxic products (CO2 and H2O) achieved for the corona and hybrid corona – catalytic reactors were in a range of 0.178÷0.755 and 0.29÷0.958, respectively. It was found that the increase of generator operational frequency caused the enhancement of toluene conversion degree for both types of reactors. On the other hand, the increase of volume gas ﬂow rate resulted in the decrease of toluene conversion degree. Experimental results dealing with gas volume fraction in air – water two-phase ﬂow through a horizontal pipe ﬁlled with aluminum foams of different pore density are presented in the paper. It was stated that gas volume fraction increased when the superﬁcial gas velocity increased. The increase of liquid phase velocity causes the reduction of gas volume fraction. It was observed that the interfacial slip phenomenon occurred. Test results indicated no effect of metal foam structural parameters on both gas and liquid volume fractions. An optimization method of first-order reversible reaction proceeding in a tubular reactor with axial dispersion is presented in the paper. The final conversion degree was adopted as a criterion for process optimality. A continuous version of the Maximum Principle Algorithm was applied in optimization. During calculations a proﬁle of optimal temperature along the reactor was searched. Some exemplifying results of optimization are presented, analyzed and described. Results of thermal conductivity measurements of six different wood species are presented and discussed in the paper. A new measurement set-up is described. New futures are characterized by thin constantan wire and low heating power. Very accurate temperature measurements were performed and recorded in time intervals of 0.1 seconds. The calculated values of thermal conductivity coefﬁcients are in a range of 0.121÷0.218 [W/(m·K)] and did not deviate from the literature values more than 5%. The lowest values were obtained for pine and the highest for hornbeam. Experimental results dealing with the grinding process of granular material in a ribbon mixer are presented. Activated carbon particles were used in the research. Milling process was performed for the selected stirrer rotational frequencies: 2, 50 and 100 rpm·min-1. An inﬂuence of selected operational parameters (stirrer rotational frequency, grinding time) on the size distribution of granular material is presented. The results enabled the assessment of grinding test efficiency. A main purpose of this study was to analyze the dissolution process of solid body in the presence of rotating magnetic ﬁeld. Cylindrical solid samples made of rock-salt of NaCl content greater than 98% (remainder being trace amounts of KCl, CaCl2 and MgCl2 ) were dissolved. The obtained results were compared with the data for typical mixing devices taken from literature. Sunﬂower seeds dehulling process with freezing is a key process in technology of sunﬂower protein production. In the frame of this work extensive experiments were carried out to obtain fully dehulled sunﬂower kernel. Regression equations which allow one to estimate inﬂuence of seeds moisture content, rotor rotational frequency of a dehulling unit and temperature of freezing on the dehulling efﬁciency were obtained. Optimal parameters for sunﬂower seeds dehulling process with freezing were determined. The description of sorption kinetics of Direct Orange 26 azo dye on rye straw by means fractional differential equations was presented in the paper. The numerical method for solving differential equations was used in calculations. The proposed kinetics equation represents a three-parameter equation: α – derivative fraction, K – kinetic constant, and n – equation order. It was found that the dye sorption for the highest concentration is equal to 22 mg/g of dry product. Therefore, this waste product can be recommended as inexpensive sorbent that could be used for the separation of colored substances from aqueous solutions. In the work an attempt was undertaken to compare the mixing effectiveness of in a vessel with eccentrically located impellers and in a vessel with impellers performing oscillatory (forward-reverse) motion. The results showed that fourfold increase in frequency causes the decrease of mixing time. Comparison of mixing time periods leads to the conclusion that the smallest mixing time was achieved for the RT-RT and RT-PBT systems (forwardreverse, Re = 9 and 29) and for the PBT-PBT system (eccentric system, Re = 40). A higher efﬁciency of forward-reverse mixing in comparison to the eccentric system disappears for Re > 40. Possibility of application of the Stereo PIV method in the determination of values and distributions of liquid ﬂow generated in a vibromixer is analysed in the paper. Flow 3-D maps obtained for selected disc positions in the mixing vessel were created. Preliminary results of investigations can be used in practice for the explanation and description of processes and phenomena occurring during vibromixing and also for the design optimization of mixing vessels equipped with reciprocating agitators. Isothermal autocatalytic chemical reaction carried on in a stirred tank reactor is analyzed in the paper. In order to determine the reaction efﬁciency integral indexes representing average concentrations of reactants and products were used. An impact of variability of reactor feed ﬂow rate on integral indexes and on the course of time trajectory of reactants and products concentrations is showed. All Rights Reserved. Designed & Hosted by CAPRISOFT S.C.